Spring is coming, and I have a problem: I don't fit into any of my spring clothes. Yes, I agree, I could go shopping for a whole new wardrobe, but since I don't like the way I look and I do happen to like all of my spring clothes, perhaps I should just exercise a bit more. It makes me laugh when people assume since I'm a mom of four little boys that I must be in great shape. My favorite comment is, "Oh, you'll work it off chasing after all those boys." To which I say a big fat PA HA! It doesn't really work that way. Sure, my arms are totally huge from carrying a twenty-four pound toddler around; but, like, dude huge, not chick muscle sculpted. Yuck. No, losing weight and maintaining your figure take real work. And real work takes real time - something moms of little ones don't have a lot of. And with snow still on the ground in most parts of the country, it's not feasible to strap your little one in the stroller right now and go for a walk. So what's a mom to do? 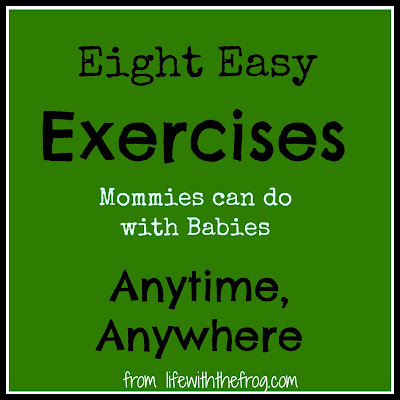 Basic exercises and toning can be done anytime. In fact, when I had less kids and more time (yes, there was such a time), I was fitting in exercise whenever I could. Admittedly, it's easier with littler kids. Whenever my older ones see me on the floor, they think it's time to wrestle! 1. 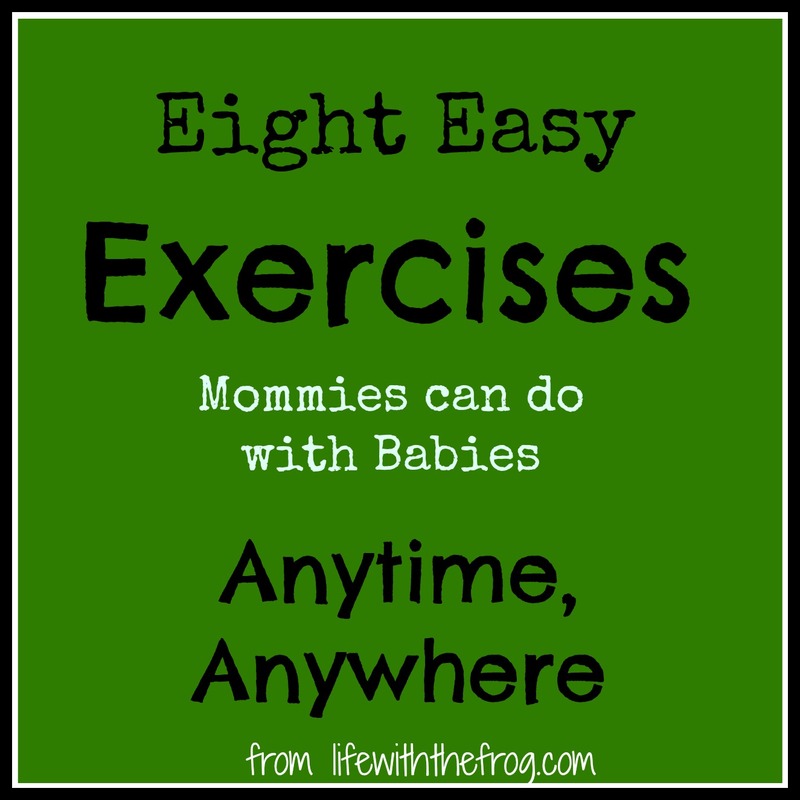 Leg Lifts (best with newborn or infant): Laying on your side on the floor or bed with your baby next to you, make sure your body is in a straight line. You may either prop your head on your hand or lay on the floor with your arm overhead. Lift and lower leg. I would do this one while nursing in the side lying position. Lift leg, bring it down in front with pointed toe. Lift leg, bring it down in back and touch your heel to the floor. Bend top knee in front of you. Lift and lower bottom leg to work inner thigh. 2. Push up and kiss (best with newborn or infant): Start in push-up position with baby lying under you. Each time you come down, kiss your sweet little baby's nose or chubby cheeks. 3. Plank (best with newborn or infant): Again, with baby lying under you or while baby is doing tummy time, prop yourself up on your elbows and toes. Be sure your body is in a straight line and your bottom is not sticking up in the air. Hold for at least 30 seconds. This is a good exercise for total body and core strength. 4. Swimming (best with newborn or infant): Again, while baby is doing tummy time, lie on your tummy facing him. Arch your back, lifting your arms and legs off the floor. Flutter your arms and legs back and forth while squeezing your glutes. 5. Partner crunches (any age who will sit with you): Get in crunch position, lying on your back, knees up, feet on the floor. Sit your baby on your tummy resting against your thighs. Crunch up, looking at and talking to baby. All the way to the ________ (fill in the blank with park, zoo, etc...). 7. Squat and toss (best for toddler): Holding your toddler facing you, bend knees to a squat, then burst up squeezing glutes and toss him gently in the air extending your arms. Bend knees again while catching him. Only do this one if it does not scare him. My boys always love it; some kids do not. 8. Stamp the ceiling (any age - while they are playing, watching a video, etc...): Lie on your back with your knees bent, feet on the floor. Lift one leg so the bottom of the foot is parallel to the ceiling. Lift and lower your hips so you are "stamping" the ceiling. Switch legs. Chased an escapee down the street. Chased a bored and maniacally laughing toddler down the corridor at the mall. Carried a twenty-five pound toddler kicking and screaming up from the playroom in the basement to his room on the third floor for nap time. Give yourself a gajillion bonus points if you've done these things while eight months pregnant (not that I'd know). 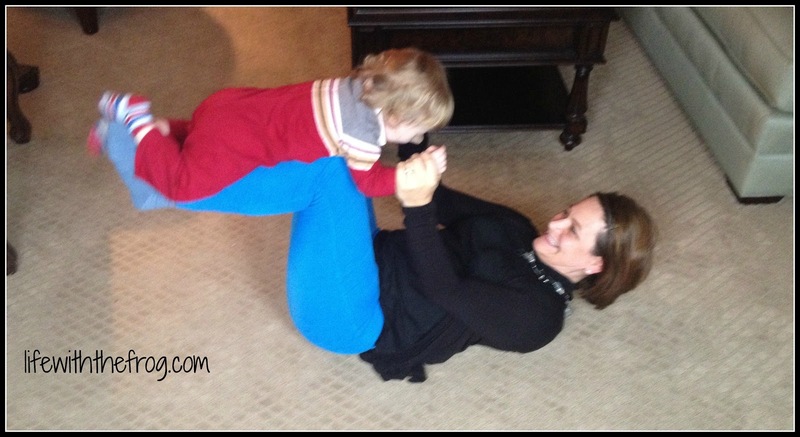 There are so many covert ways to get in your toning exercises with little kids. You just have to step away from the computer/laundry/dishes/phone and make the time.